Consumer journalist Christine Toner reflects on her scary experience and suggests ways to prevent a burglary in the darker months. If you’ve ever had your house broken into you’ll know how traumatic it can be. Regardless of what is taken, the very fact that strangers have been in your house while you’ve been out or, worse still, asleep is extremely unsettling. Around this time last year, my husband and I were at home with our two young children. At around 3am my daughter woke wanting a drink so my husband headed downstairs only to discover two men tiptoeing around the ground floor of our home with a torch. When my husband banged on the wall to startle them they quickly ran off and thankfully hadn’t taken anything with them or caused any damage. The police later told us it was likely they were looking for car keys – and so determined were they to find them that they bypassed ipads, laptops and televisions in their search. The incident left us all a little shaken up but it also made my husband and I question what we could have done to make our home more secure. It’s something many of us will be thinking of now the dark nights are here. 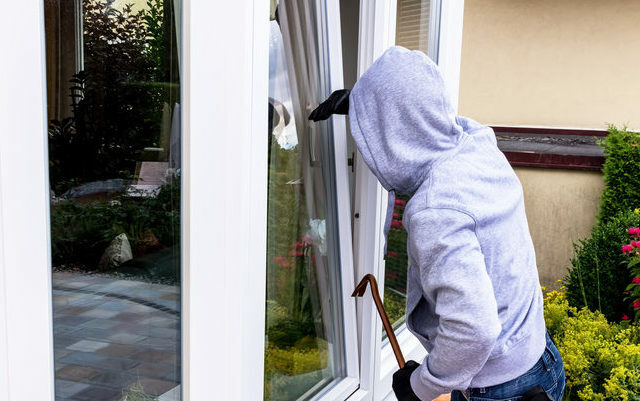 Indeed, according to a survey by double glazing firm Everest, during the winter months, we tend to see a 25% rise in burglary incidents in the UK. So what can you do to minimise the risk of being broken into? We take a look. There are several different types of alarm and costs vary depending on the type you go for. A bells-only alarm, which will make a noise but won’t actually contact anyone, will set you back around £125 – £300. A dialler alarm, which will automatically dial your number or a number of your choice if an incident occurs, will cost around £175 – £350, while a monitoring alarm, which can cost around £99 upfront and will have a monthly fee, will see the alarm provider contact the police on your behalf if the alarm sounds. It may go without saying that you should check your doors and windows before leaving the house or going to bed but the second I realised there was someone in our house my first thought was “Did I leave the back door unlocked?”. Make sure you check all windows and doors are locked and close your front gate as reports suggest burglars see a gate left ajar as a sign security is not high on your priority list. It’s an oldie but a goody. Leaving a light on is a great deterrent as it suggests a) you’re home and b) you’re awake. Rather than seeing your electricity bills soar, invest in a fake TV light (from £11.99 on Amazon). These lights simulate the lights from a television, including changing the light would as if showing different scenes. What’s more, they use less power than a nightlight. If you were sneaking into a property to get up to no good and a great, beaming light came on, chances are you wouldn’t continue! Outdoor sensor floodlights cost around £21.99 (V-TAC 50W LED PIR Outside Flood Lights on Amazon). If you have tall trees and thick bushes outside your home this provides a perfect cover for a potential burglar. Once behind those trees, the thief knows neighbours will be unable to see their dodgy dealings. Protect your property by cutting down trees and bushes that provide a hiding space. You may be keen to show off your Instagram-worthy living room following your most recent renovation but advertising your belongings like you’re a high street shop is not a smart idea. Fit blinds and curtains to maintain a bit of privacy! and don’t forget at this time of year, it’s getting lighter earlier at around 4pm so you’ll need to pull your curtains and blinds earlier to prevent everything being on display. Sadly it’s a tried and tested trick – burglars will push a stick or wire through your letterbox to hook your keys off the windowsill or hall table. And if you don’t take steps to prevent this you could end up invalidating your insurance policy (as the insurer could claim you didn’t take ‘reasonable care’ to protect the property). Fit a cage to the inside of your letterbox to prevent thieves and keep your keys in a safer place. You may not think you have the time to attend the meetings or go patrolling the neighbourhood each night but joining the neighbourhood watch is a great way of deterring burglars because it shows you’re big on protecting your home. Being on a local email circulation list is also a great way of hearing about what’s going on locally and whether there are certain types of burglaries on the rise e.g thieves targeting garages, that you can act on. Display a neighbourhood watch sticker in your window and thieves are less likely to target you. Talk to us to save yourself time and money. Call A-Plan now to see how we can help save money and make finding the right insurance cover that little bit easier.